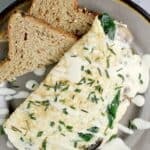 This healthier egg white omelet with vegetarian sausage, spinach, and mushroom, will satisfy you breakfast, lunch or dinner. If you have goals this year and want to eat better to get there, this recipe is for you. This year, I actually do have some big goals. I have resolved to complete a challenge to myself to hike each week at least once, since hiking is one of my now favorite things to do — a new hobby I picked up in 2018. And I am going to start racing in triathlons again, having signed up for half and full Ironman races (YIKES). 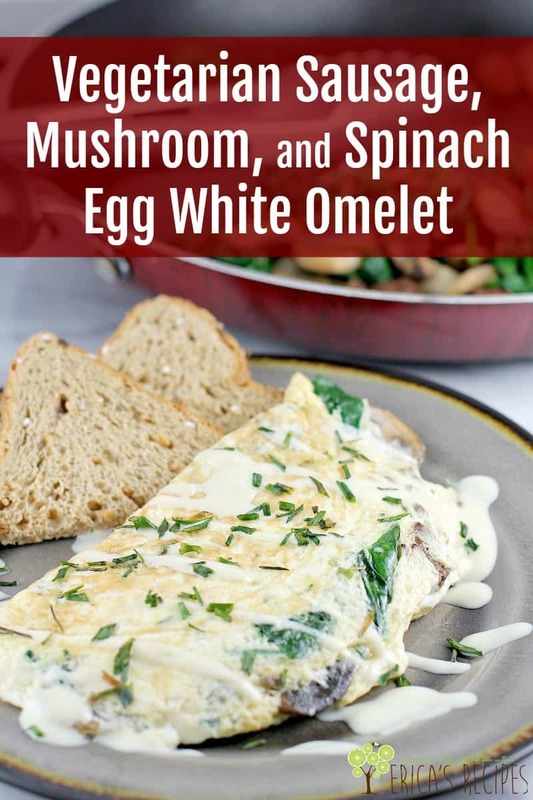 So eating better will be paramount for me to reach my goals this year, and one thing I need to have ready are filling, satisfying recipes like my new egg white omelet. So while I have those big fitness goals, at the same time, I am very time limited. Like, ridiculously time limited. Because I do other stuff too. As I am typing, I just got home from cooking a dinner for 50 people at church. Honestly. Yeah, free time …not so much. So I need approachable meals that are ready fast. Also affordable (always a miracle when I manage to pull that off), give me variety, and of course balanced nutrition are bonuses too. Omelets are a great solution for me and have long been a go-to trick of mine to end the day for DINNER to ward off later-night munchies. 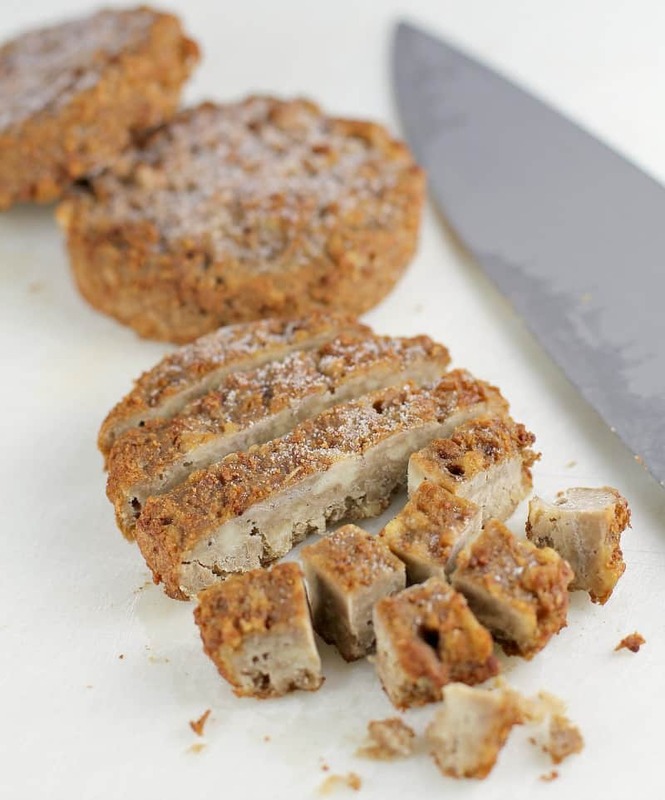 For this recipe, I am working with MorningStar Farms® Sausage Patties for a great way to get super satisfied with my dinner AND get vegetarian protein. Remember when I trained for Ironman Louisville in 2016? I went pretty much vegan for those 8 months. Well…. I’m not going there again. But I still want meatless nights more often than meat nights, you know? 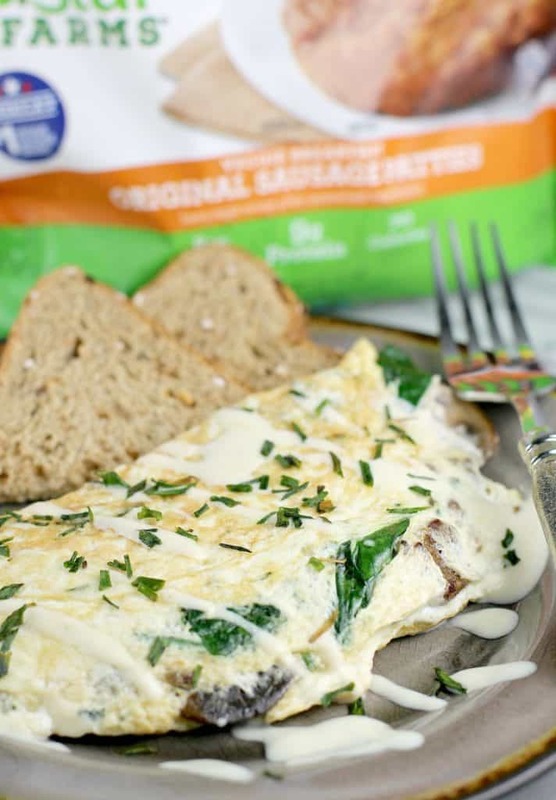 MorningStar Farms® Classic Breakfast options like sausage, maple sausage, and bacon, deliver taste I crave, but totally help me stick to goals because I feel fulfilled and, um, full when I make a recipe like this egg white omelet thanks to the vegetarian sausage + egg whites >> Protein! Also, my family really liked this recipe. While I was making my customary breakfast-for-dinner omelet, because this was a new recipe for this post I made it for all my family. The teen loved it. The young one was in the middle, because mushrooms, and my husband really liked it which is especially good because he is a total carnivore. See? 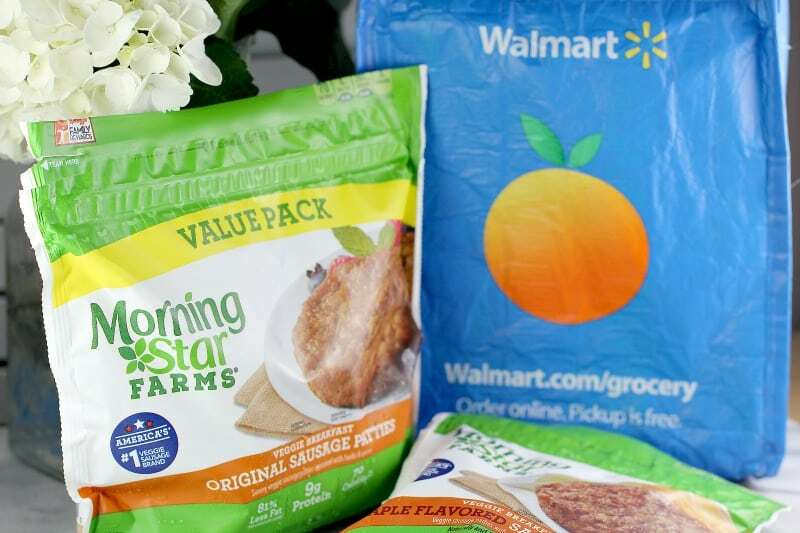 Not only for vegetarians, MorningStar Farms® can be for anyone trying to live better. Another thing I like about MorningStar Farms® products is how they make life easier, especially on a weeknight. This is food, ready as-is, just heat. My daughter was literally raised on MorningStar Farms® Chik’n Nuggets because they were ready in the microwave in a hot minute. Boom. …Find all these good things at Walmart too. 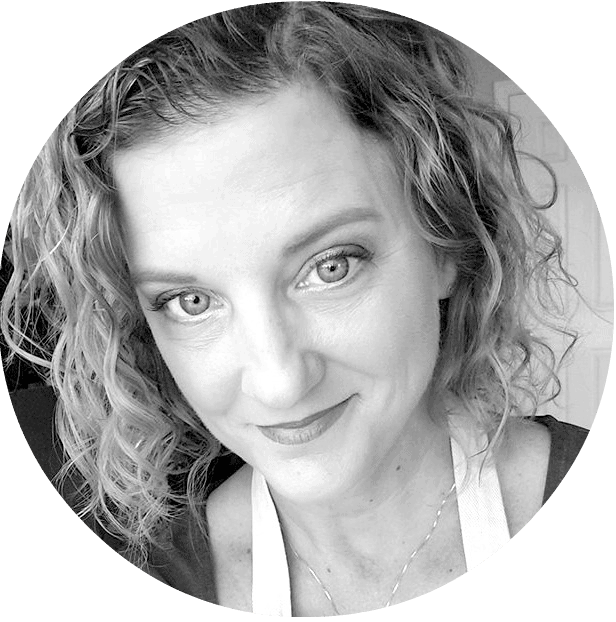 Why make an omelet for dinner? Because it will cook up FAST. 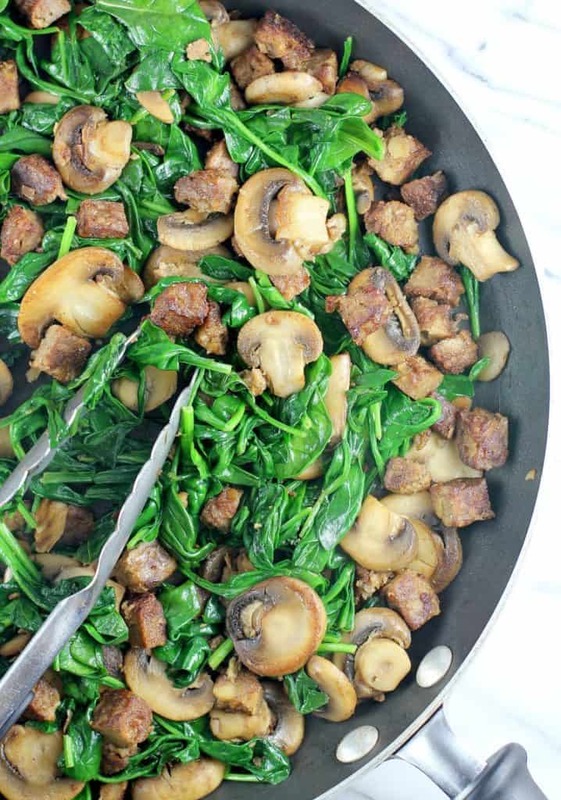 Because you can make it healthier with veggie sausage, veggies like spinach and such. This is a perfect way to use up random bits of pretty much leftover anything. A little parmesan goes a long way, so use that for cheesy flavor rather than a lot of some other cheese. Breakfast for dinner is FUN. Kids get excited even. Use egg whites (with or without vegetarian sausage) for lean protein with little cholesterol and stick to all your goals. Use a combination of olive oil plus olive oil cooking spray plus a nonstick pan to make this recipe with fewer calories. Add spinach because you need it. Yes, you do. Don’t whip up the egg whites too much before cooking because that would make them weird. Adding the parmesan directly to the egg whites before cooking adds tons of flavor and helps give the frail egg whites some more umph to hold together. 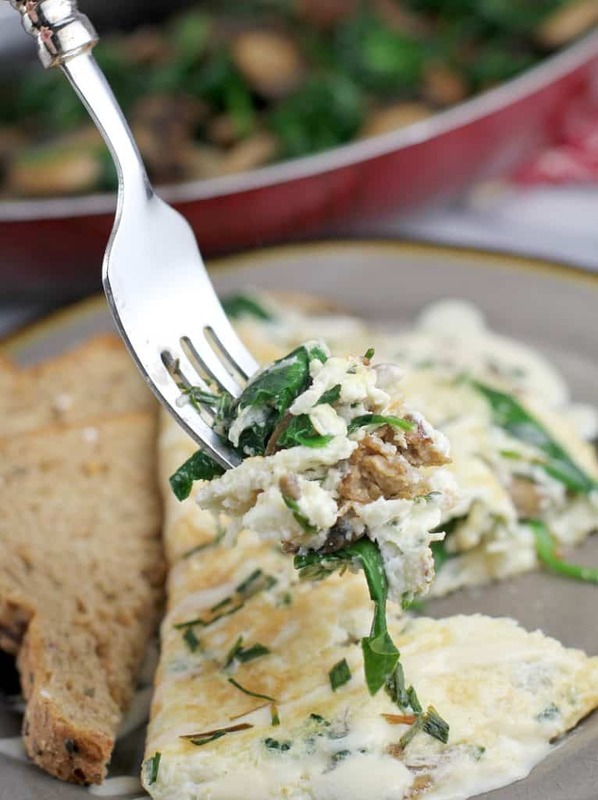 Use plenty of cooking spray when it comes to making the final omelet. For the love of God, you don’t want stickage. For that pivotal moment to fold and form the omelet, put the pan handle to your stomach (yes, really), then from the other side, use two rubber spatulas to fold towards you (while your belly pushes back to hold the pan in place.) Just trust. That first bullet is key. I would normally make mushrooms with 2 tablespoons of butter or oil. But by 1) using cooking spray to supplement the little oil we do straight-up use in a 2) nonstick skillet, we can keep the mushrooms happy (for the most part, because let’s be real this isn’t the same as when Julia Child does this in two tablespoons of butter) …but it is enough. And the last is the best with this recipe… a Dijon “sauce” made very simply with a touch one teaspoon Dijon mustard and one tablespoon light buttermilk. 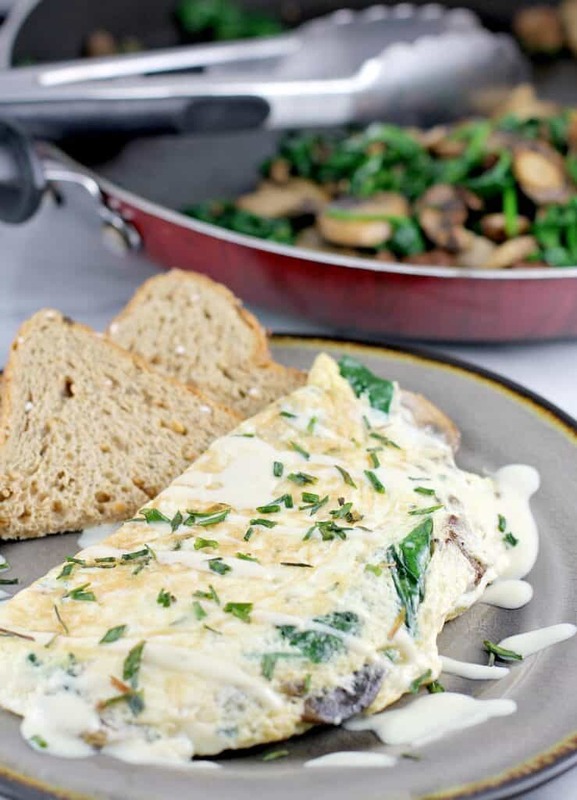 Drizzled over our omelet, we are instantly proud we stayed on track, and this flavor combination is magical in the satisfaction and satiation it brings. 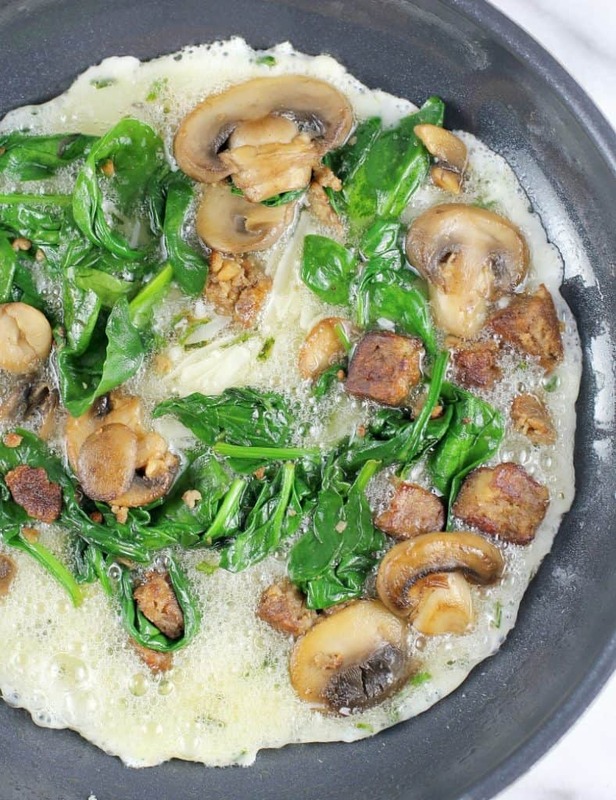 This healthier egg white omelet with vegetarian sausage, spinach, and mushroom, will satisfy you breakfast, lunch or dinner. Heat the oil a medium nonstick skillet on high heat. Use cooking spray to ensure the skillet is coated. 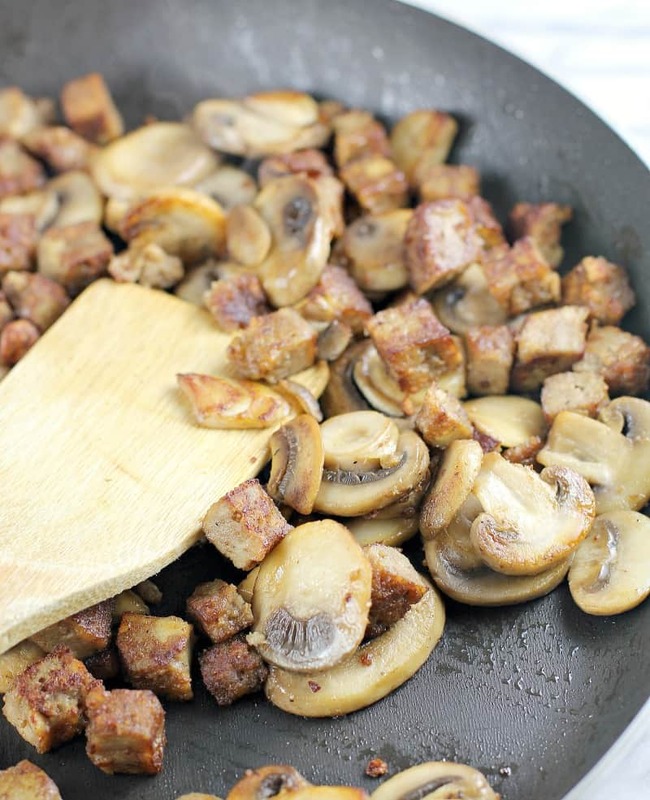 Add the mushrooms and MorningStar Farms® Sausage and cook over high heat, tossing regularly, until mushrooms and sausage are well browned. Add the spinach and, using thongs, toss until spinach is nicely wilted. Remove from heat. 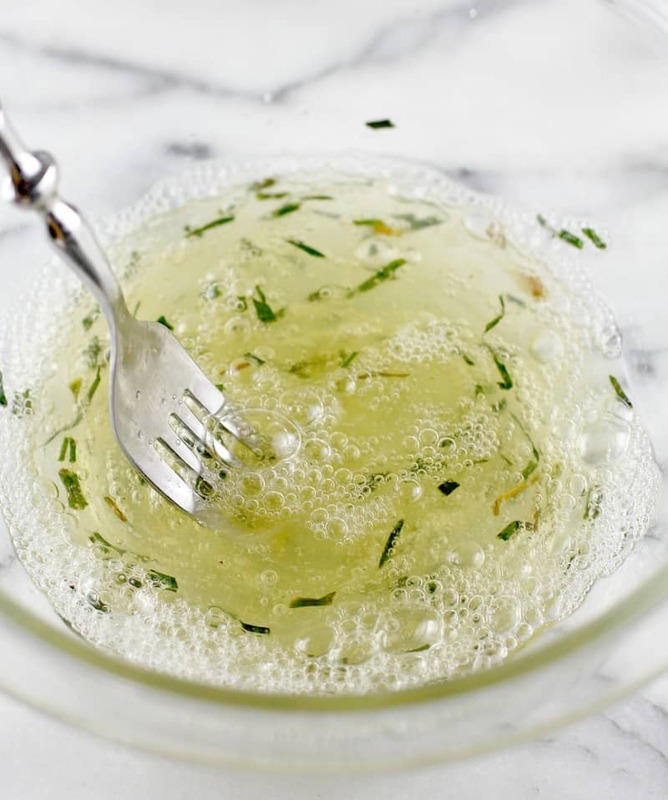 In a small bowl, whisk together the egg whites, garlic powder, salt, chives, and parmesan. In a separate small bowl, stir together the buttermilk and Dijon mustard. Spray a small nonstick skillet with cooking spray, and heat over medium-high heat. Add the egg white mixture. Top with the mushroom-sausage mixture, spreading evenly over the egg whites. Cook until egg whites are starting to set (at least half way set), then use a rubber spatula (or two), to fold one side of the egg white disk over the other, to form a half moon shaped omelet. Allow the omelet to continue cooking, gently turning over once, until cooked through. During this time, you may want to reduce the heat to medium. You just want to get the egg to set. 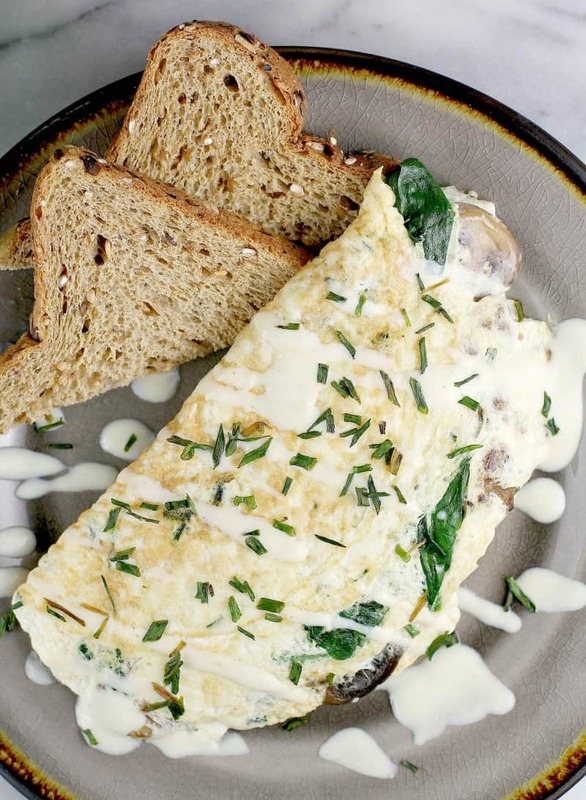 Drizzle the buttermilk-Dijon sauce over the omelet. Garnish with extra chives (if desired) and serve. In my photos, there is more food than in the recipe listing here. This is because I took these photos when I made this recipe for my entire family. It is easy to multiply and serve more people. For more recipe inspiration, visit the social hub. And leave me a comment! what are your hopes, your dreams, your New Year’s resolutions!